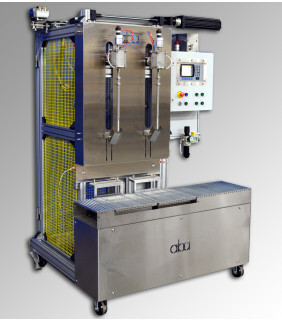 Bottom fill machines are typically used for filling tight head containers, foaming products and static prone solvents. 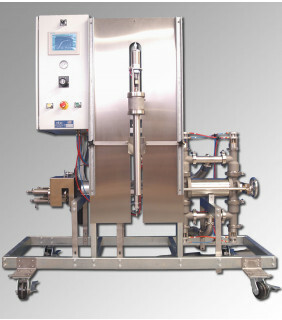 ABA is renowned and well respected throughout the industry for being a leader in bottom fill machines. 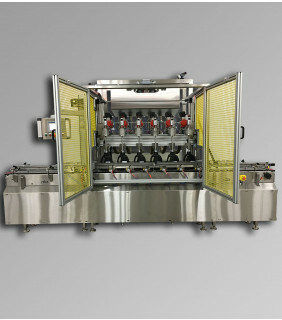 Moreover, we supply some of the largest and most prestigious companies in the world with all types of net weight and volumetric liquid filling equipment. Our bottom fill machines come in various models, sizes and types and can offer a wide range of capacity levels, depending on the model chosen. We supply both semi and fully automatic bottom fill machines designed to handle a wide range of container sizes. In addition to the submerged lance filling systems, our bottom fill machines can also be set up to be used for top fill filling. When in bottom fill mode, the fill nozzle on our bottom fill machines, remains immersed under the level of the liquid. As the fill carriage slowly rises during the fill, the head remains submerged in product to prevent potential static build-up and foaming. When changing to fill in top fill mode, the customer can quickly and easily change the fill heads to ABA’s standard cone style and increase the speed and throughput on open top containers. Depending on your industry needs, there are several models you can choose from. ABA has a large selection of top rated bottom fill machines. Our extensive experience, superior customer service and quality designed and manufactured custom machinery are just a few of the reasons we are highly regarded within our industry. ABA supplies some of the biggest companies all over the world, with all types and models of bottom and top liquid fill filling machines. Our machines are made of the highest-quality steel and materials and are engineered for today's technologically advanced world. 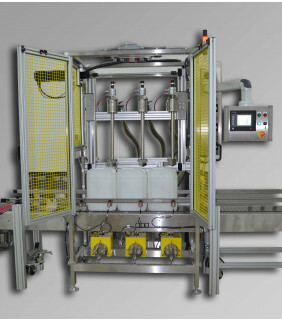 No matter what type of volumetric and net weight (gravimetric) liquid filling machines your business needs, ABA can supply it. Call or visit us today and one of our professional machine experts will help you.